There is an obvious synergy here with the sofa. They are Batman and Robin, C3PO and R2D2, Gilbert and George. In fact, many of these dead armchairs were found alongside their associated sofas (ah, that’s suite) and have been waiting to be featured here in all their glory as distinct, unique, albeit co-dependent, items. As if to reinforce this close relationship, these two armchairs have actually been nailed together to create a quasi-sofa. The question then is whether they should be regarded as a sofa, as intended, or two armchairs? In the end I’ve come down on the side of division, on the basis that what can be put together can also be taken apart. They should be treated as their original maker intended. So is an armchair just a small sofa (or vice versa)? At first glance, that would appear to be the case but there are important differences that suggest an armchair is much more than just sofa minutus. To lump them all together with sofas also ignores those armchairs which exist as autonomous items, independent of any sofa for their identity. Unlike most sofas, armchairs are often loved to within an inch of their lives, worn down to the barest foam and padding. Threaded. They appear damaged, abused and over-used to a degree that is rarely found with their larger cousins. 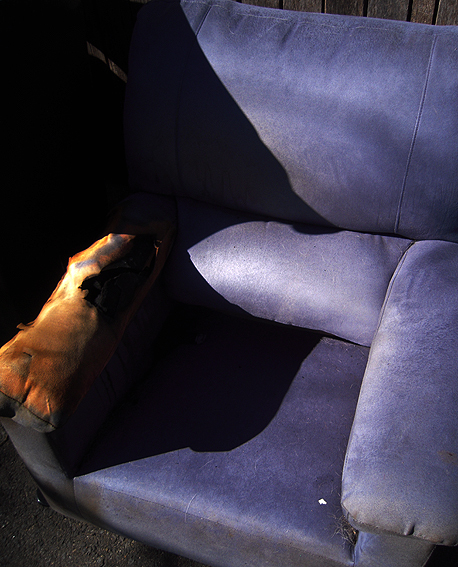 Armchairs are more likely to appear on the street bearing evidence of prolonged occupation – the rubbed arms, the crushed cushions, the saggy bottoms. Not all armchairs are affected in this manner, it is true – there are exceptions – but there are enough to suggest a pattern of behaviour. An armchair is personal whereas a sofa is shared. An armchair can be claimed but sofa space must be negotiated. An armchair is our own little fiefdom, entire unto itself, while the sofa is common land open to all and sundry to plonk themselves down willy-nilly. An armchair says Me; a sofa says Us. 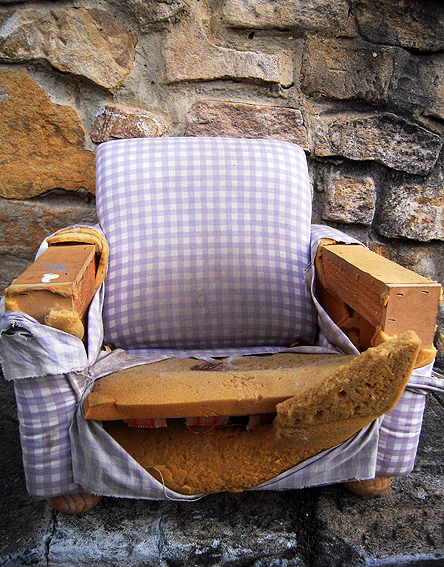 Dumping a well-loved armchair is akin to shedding our favourite coat or wearing out those boots that were ever so comfortable but which, unfortunately, are no longer made. Our bodies adapt themselves to the feel of a good armchair, anticipating what it is like to slot into that space even in the act of doing so. Anything else doesn’t feel quite right, like a tune sung off-key or a new filling in the gap where our tongue habitually rests. To get rid of a favourite armchair then is to go against the body’s tendency towards inertia and stasis, its primordial longing to return to a vegetative state. It’s a traumatic event. Then there is the history, the things seen and done, the places travelled (vicariously at least) while occupying that seat. A person and an armchair can grow old together, sharing the same memories, storing the same feelings. It is an attachment best summed up by Martin Crane in the Frasier sit-com whose recliner is the archetype for all those patched-up, worn out, smelly old relics.